Defending Ring of Combat middleweight champion Eric ‘The Viking’ Roncoroni (5-2) has it all. 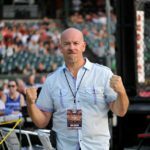 He’s got the rugged movie star good looks, humility, the ROC title, several superior places to hone his skills…Claudia Gadelha’s new facility in Stroudsburg, PA, and New Jersey facilities in Carnicella MMA, and elite BJJ trainers Mike and Andy Main at Pure MMA. Roncoroni also has the ability to just knock his opponent into tomorrow. His vicious KO by knee over Mike Elshamy, was the highlight of the last ROC event. He now faces K-Dojo terror, Rusian Melikov. Melikov has a strong Sambo background and absolutely wants to take this fight to the ground. The Viking has KO power in his hands, knees, and kicks. He is the kind of fighter everyone likes. He fights to finish just like all five of his previous victories. This is a very interesting match-up and a tough test for the defending champ. Do not go to the bathroom or grab a beer during this one, you could be sorry! 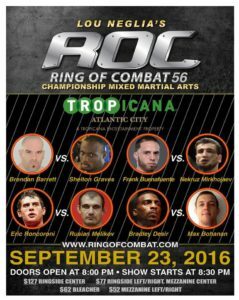 Ring of Combat 56 goes down in Atlantic City, New Jersey, next Friday, September 23. We spoke with the Viking ahead of the fight.